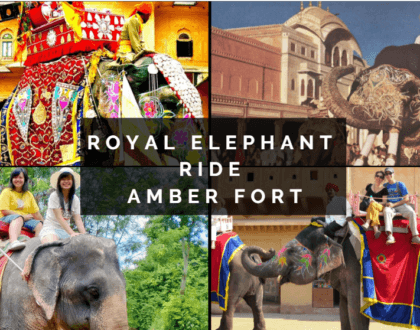 Amer Fort which is also popularly known as Amber Fort, situated in Amer a small town situated at a distance of around 11 Km from Jaipur. The fort and the village derived its name from the name of the deity Ambe of Meena dynasty or Kshatriya’s empire. 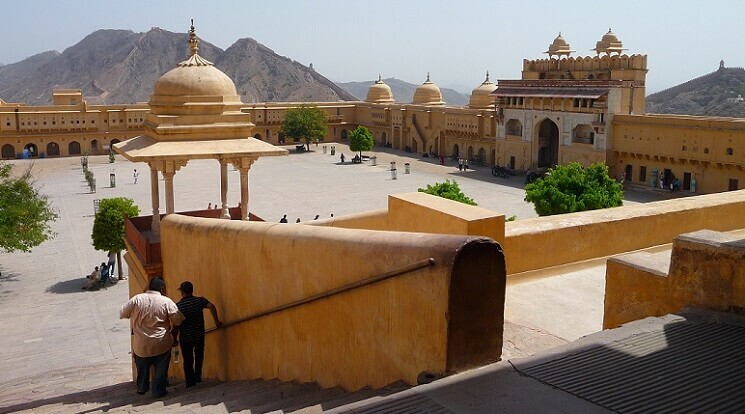 The Amer Fort is considered as one of the best tourist attractions of Jaipur, let me correct! Not in just Jaipur, but in the entire Rajasthan. 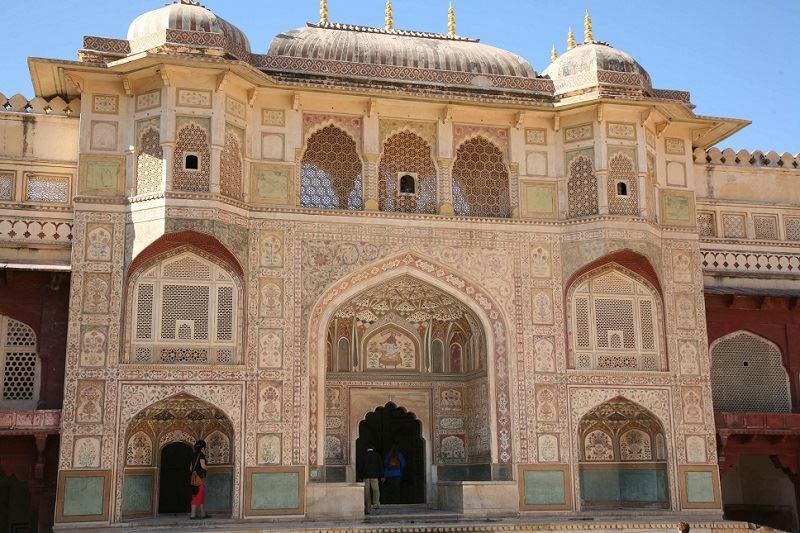 Amer Fort is renowned for its splendid architecture, artistic work, and its four levels of courtyards. According to the report shared by the Department of Archeology and Museums that Amer Fort is visited by on an average 5000 visitors a day. After reading above-mentioned words in the kudos and commendation of the grandiose Amer Fort, I know you are surrounded by numerous questions like Who built Amer Fort?, What about the history of Amer Fort?, What makes Amer Fort differ from other forts of Rajasthan? etc. 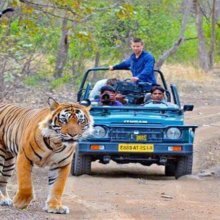 So, here in this blog, I am trying to calm all your pry regarding the magnificent Amer Fort and give the informative answers to all your questions effectively. 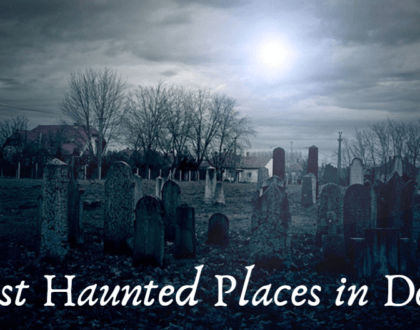 This section is sounds to be more interesting for history buffs. 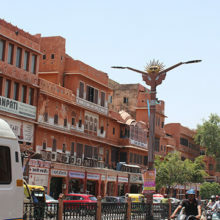 Amer was once named as Dhundar, during the era between 11th to 16th century when Kachhwahas ruled over the Amer before the capital of Rajasthan supplanted to Jaipur. Amer Fort was built by Raja Man Singh in the year 1592 AD and which was later renovated by Raja Jai Singh I. Raja Man Singh, is one of the nine gems known as ‘Navratans’ of the royal court of Emperor Akbar. According to the legend, the region of Amer was ruled by Meena King named Raja Ralun Singh, who was known as a very kind-hearted king. He adopted a Rajput mother with her child who comes for the haven in his realm. But, in appreciation of these favours of Meena King, the Kaccwahas Rajput makes a conspiracy and killed the weaponless Meenas on the Diwali day when all the Meenas were involved in performing their rituals of Pitra Trapan and conquered the region of Meenas’. This act of Kachwaha Rajputs was considered as the most atrocious and dastard. After this massacre, most of the bygone structures developed by Meenas have been demolished or reinstated by the kings ruled over the area later, but this fort has stood proudly against all the attacks and assaults. Raja Kakil Dev ruled over the Amber in 1036 on the site which is currently covered by Jaigarh Fort. Later, it was ruled by Rajput Kings Raja Man Singh I, Raja Jai Singh and his descendants. Now it’s the time to speak out about the tremendously constructed robust structure of the Amer Fort, its allure, elegance, and its artistic work. 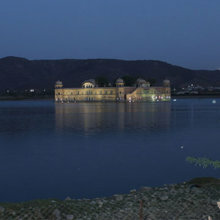 The beauty of the fort becomes double with the panoramic view of the Maota lake situated in front of the Amer Fort. 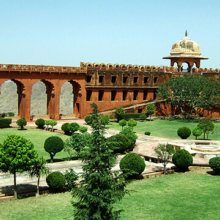 The structure of the Palace is made up of red sandstone and marble, which is divided into four major sections and each section has its own entry gate and courtyard. 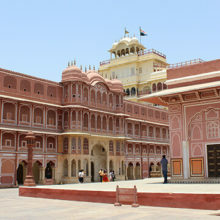 The main entrance to the palace is through the Suraj Pol (Sun Gate), which confront east towards the rising sun and goes towards the Jalebi Chowk (a place for soldiers) the main courtyard, where the Rajput army does the victory parade after their return from the battle. This was also witnessed by Royal family women through the latticed windows. 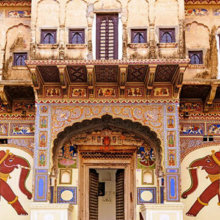 In the first courtyard, a splendid stairway through Ganesh Pol (Ganesh Gate) leads towards the entry into the palaces of the Rajput Kings. Ganesh Gate is named after Lord Ganesh who removes all the impediments in life. 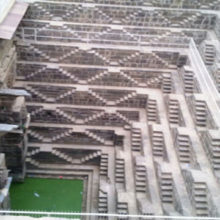 On the right side of the stairway, the stairs going up towards the Sila Devi Temple. The doors of this beautiful small temple are covered with silver leaf decorated with various images of the Goddess. 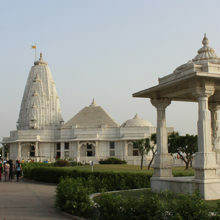 The main image of the deity is placed inside the temple flanked by two silver lions. 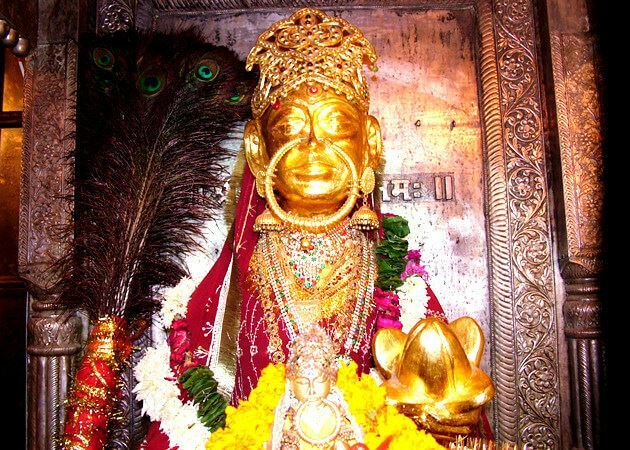 There is a tale behind the establishment of the elegant Sila Devi Temple. Once Maharaja Man Singh pray Goddess Kali and sought blessings for his victory over Raja of Jessore, Bengal. Then, Goddess Kali comes in the dream of Raja and instructed him to bring back her image from the seabed and install and worship it. 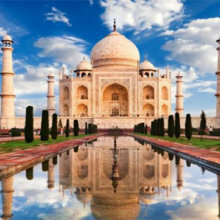 So, after his victory over the battle of Bengal, which held in the year 1604. 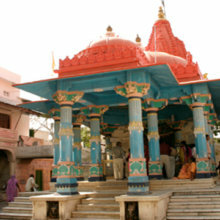 Raja retrieved the idol of the Goddess of the sea, which carved out in one single stone slab and installed it into the temple and gave the name Sila Devi Temple and from then onwards the deity was worshipped by the Rajput family. During the religious days of Navratri, the sacrifice of buffalo or goat on the eighth day of the Navratri, in front of the temple in the presence of the Royal family or devotees. But after the ban on this practice in the year 1975, this event was squeezed into a private royal event. 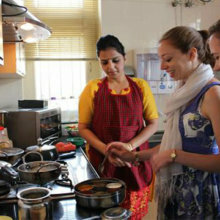 Now, the practice is completely banned and offerings are a pure vegetarian type. Now, we step into the second courtyard resides the Diwan-i-Aam (Hall of Public Hearings) built by Raja Jai Singh decorated with enchanting ornamented pillars and mosaic glass work used for the public appearances of the Raja during the festivals and events like victory in battles, Diwali, Dussehra, the birthday of Raja. 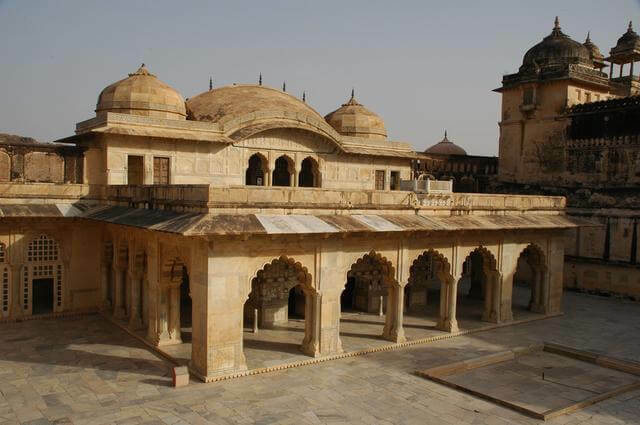 This courtyard houses the private rooms of the Maharajas, his family, and attendants. The entry of the third courtyard is the Ganesh pol (Ganesh Gate), which is decorated with Diwan-e-Khaas (Hall of Private Audience) decorated with mosaic glass work. Sukh Niwas is situated opposite to the Diwan-e-Khaas, The doors of the place are made up of sandalwood and ivory. 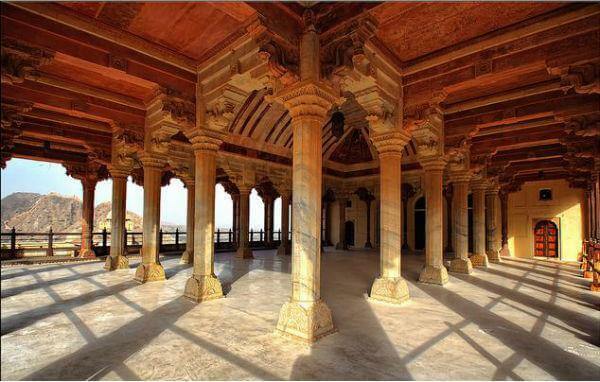 Sukh Niwas was used by Kings to spend quality time with his queens. The climate of the Sukh Niwas was artificially created cool. This courtyard also houses the Mughal Gardens and Jai Mandir is popularly known as Sheesh Mahal (Mirror Palace ) one of the most stunning parts of the Amer Fort. 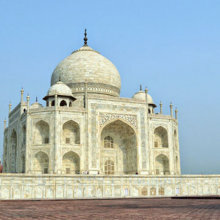 The reason behind the making of this Sheesh Mahal with glass was during the ancient time queens was not allowed to lie down in open, but she loved to see the stars. So Raja Man Singh ordered to his architecture to build the palace in such a way which could complete the purpose. So, If two candles are burning in this hall, then the reflection of the light converts into a thousand of small stars. This courtyard belongs to the Zanani Deorhi i.e. the area for the royal ladies and their female attendants. 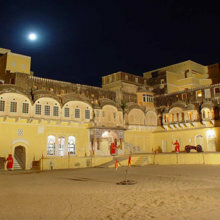 The courtyard has numerous corridors, living rooms, and also houses Jas Mandir. 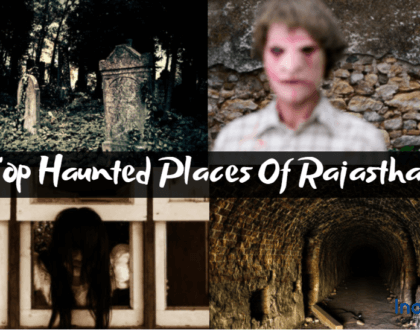 On the backside of the women’s quarters, there is a hidden tunnel which is around 1 or 2 Km long leads towards the Jaigarh Fort, which is situated on the Cheel Ka Tilla. 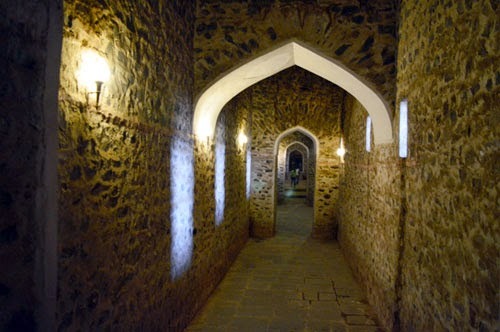 The tunnel was used by the royal family to escape through the tunnel and be safe inside the Jaigarh Fort at the time of war or attacked by enemies. 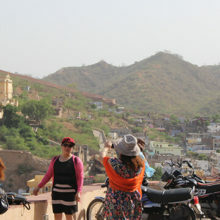 Apart from exploring the gargantuan Amer Fort. 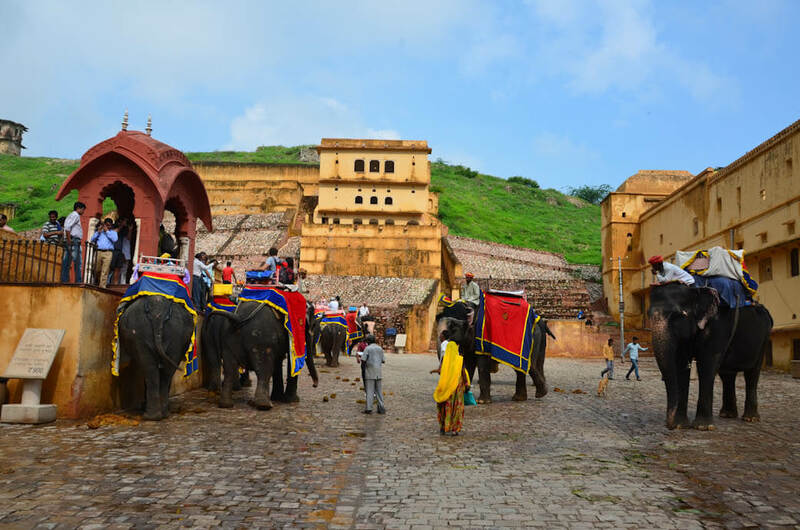 There are some other interesting things to do in Amer Fort. 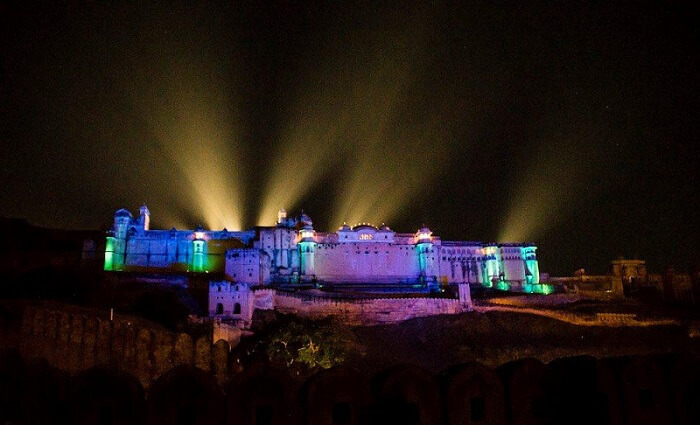 Light & Sound Show – The evening Light & Sound show is the major attraction of the Amer Fort which tells the story of the Rajput kings, their imperial lifestyle and about their wars held at Kesar Kyari. This grandiose show was narrated by Megastar of Bollywood Mr Amitabh Bachchan in English and Hindi both. *Note: From 1st to 10th October there will only be an English show at 8.30 pm.